My metal detecting video is a copy of the first metal detecting, reality, TV series. This TV series, “Exploring Historys Treasures“, was produced for TV, by me and a professional film crew. It was not a series that was produced by amateurs. Sure, you can visit YouTube where thousands of amateurs have posted their videos, and watch the results. Many of them are interesting and well done. But honestly, many of the finds in those videos are planted before filmed, and many videos are spin-offs of what we filmed at Exploring History’s Treasures. Too boast a bit. I'm proud of the fact that we were one of the first to produce a metal detecting video for You Tube as well as for TV. In Loving Memory of My Friend and Co-host John DeCharo. RIP My Friend! "Frank, have you watched the new dig it metal detecting tv show? The guys are idiots and the show is terrible. I miss you and John bantering back and forth. PLEASE, PLEASE film some more. Dave and the M---- family say thanks again." "Hi Frank, the last time I emailed you was when I bought your DVDs. I told you how GREAT they were. Now I email to tell you they seem even better now that I’ve watched the new metal detecting series. You guys got it right. These new guys are aweful, and the production is nowhere as good as yours. You have to find a way to bring EHT back. I know money was an issue, but hell, recruit guys like me to get investors to help out. You told me you went that route before but raised little money because the interest didn’t seem to be there. Now the interest is there. Use your happy customers to bring in the funds so you can film more. WE WANT MORE!!!" Example, when we filmed our Ghost Towns of the East, TV series, there were few if any videos on Youtube that showed detectorists searching for or detecting around the old stone foundations. That’s because very few people knew they existed. With millions watching our series many saw an opportunity they did not know about. Now there are thousands of those videos. Our TV series began the onslaught of copycat videos, and metal detecting, TV shows. However, there is one ingredient that can not be copied, and that is the reality of what we filmed. What do I mean by “real reality?” It means we did not script before shooting our metal detecting video. The so called reality, metal detecting shows today, are scripted before shooting. Certain phrases like “juice” being yelled when even a wheat cent is found is screamed by the detectorists to show excitement. Jumping up and down like a lunatic after a nice find is made has been a common practice as well. And the planting of so many finds as mentioned earlier is so blatantly obvious that it becomes pathetic and unrealistic. The reason why those shows are filmed that way is because of budget costs. They can’t afford to wait all day for a decent find to be discovered, so they plant them. The shows are produced, not by the guys detecting, like mine was, but by budget conscious production companies who work for the networks. And those production companies have no idea how to produce a metal detecting TV series. I never worried about a budget when we filmed our metal detecting video. If we filmed ten hours in one day to get ten minutes of airtime, then that’s what we did. For anyone who has been metal detecting for a while, you know that there are many days you go out and do not find one nice keeper. I knew that, that’s why we filmed until we found something. We never planted a coin or a find to enhance the show, or to meet a budget deadline. Oh Yes, They Were Planted! I’ve watched some of those TV shows and videos on Youtube where the detectorists walk onto a five acre site and begin to find old coins or relics within 2-3 minutes of filming. Give me a break. Think about it. They immediately knew where to detect on that five acres? I’ve sat for hours with my editing guy, going through our show. So I have a pretty good eye when it comes to where the cut and pasting were made in video. And, I can tell from the editing that those finds were planted before filming. The results of our efforts was so overwhelmingly positive, that our 13 episodes were chosen to be viewed, at the NATPE Convention (National Association of Television Professionals and Executives) in Las Vegas Nevada. This was a very prestigious honor for us. To be viewed by TV exec's and professionals from all over the world was exciting. I am very proud of the fact that we were the first production company to film an exciting, metal detecting, reality, series for television. Our metal detecting videos and TV series were seen and purchased in S. America, parts of Europe, and Canada. In the U.S. our series was placed at prime time slots on cable channels in every State. Sure, we call our TV series a metal detecting video, however, our 13 episodes go much deeper than just showing a couple of guys digging coins. High schools have used our series to teach a part of American history rarely talked about. And, I have traveled to high schools and colleges as a guest speaker. Do you enjoy metal detecting, as well as the adventure it may bring? If you do, then you will enjoy our TV series. We no longer sell DVD’s. My TV series can be viewed by purchasing a PDF form of the series. 13 links are provided in the PDF. Each link is half hour show. Just copy and paste the links into your browser to watch. Hi Mr. Pandozzi, thank you for sending the links for the downloads of your TV series. Your Ghost Towns of the East series was AWESOME! It was so good that I am now in search of ghost towns. I have been on a 6 day journey across a few states having an adventure. I have camped out in the back of my Nissan Xterra at night where ever I can find a quiet spot. I have a power inverter for my truck, so I watched the first 5 episodes that I had downloaded on my computer while laying in the back of my Xterra. Although I'm not sure of what you and John discovered on the very end of the 5th video...I'm guessing it was a coffin? but i'm not sure. Is there more video to this?... because it ended and I didn't have anymore videos to watch! I was originially researching ghost towns when I came across your web sites, so all your tips were welcomed since I'm brand new to this. So far there has been a lesson learned about metal detecting around these old towns.... its really FUN! Thank you for putting on a great show that is full of knowledge, and I will keep track and check back often. Take care and happy hunting! Do not purchase this series if you want to see a bunch of people digging planted coins in a farm field. However, if you want a metal detecting video series that entertains, and shows you what kind of possibilities you can encounter if you go beyond parks, and school yards, then this metal detecting series from, Exploring History's Treasures," is what you have been looking for. "I want to congratulate you on your series. I purchased the series yesterday and am over half way through all of the videos. They are very well done. It is nice to find a show on metal detecting that I can watch while the weather here is rotten. I enjoy watching Frank and John as they dig up the past. 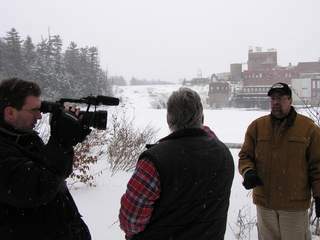 Respectfully Jeff H, Canada"
Our TV production, "Exploring Historys Treasures", became so successful that Archaeologists tried to close down my production company. When our TV series "Ghost Towns Of The East” first hit the airwaves, the Archaeological community verbally attacked my show, and my co-host John, and I. Apparently, they were upset because we were showing the viewing public how to locate and dig relics, even though we were on private property. Watch our metal detecting video series for yourself. You decide what all the commotion was about. You can watch our brief metal detecting video trailers at the link below. Be patient, depending on your computer system, it may take a few minutes to load. Learn from John and I how we locate Eastern ghost towns. Watch us dig relics that were lost hundreds of years ago. You will also learn the best way to metal detect around the old cellar holes, and where those buried, cellar hole caches may be hidden. We'll take you on a real life treasure hunt for a Doctors buried cache from the 1800's. You will travel with us as we go on a 130 mile adventure as we relive a French & Indian War battle. Learn how we researched and located old logging camps of the 1800's. Frank: Thank you for sending the Ghost Town DVD from your TV series. I am sorry I did not get back to you sooner. My husband and I watched the DVD before showing it to my classes. Alex, my husband told me to tell you that he is now a loyal fan. He loved it! I feel the same way. We had no idea there are ghost towns in the east. You really captured the mood of how life was lived in the east, hundred’s of years ago. I showed the DVD to five of my junior high classes. The response from the students was remarkable. As I mentioned to you when we first met, I was in the process of teaching them the history of what life was like during the 1800’s, your DVD enhanced my teaching. The students have asked questions that I would have never imagined. The DVD gave them a sense of excitement about the pioneers of that period. I could have never taught them in a more exciting way. Thank You!! We are looking forward to having you in our classes in two weeks. My students keep asking me what day you are coming. They are excited that they have a chance to meet a real treasure hunter. Respectfully, Susan P----- M-----"
THE DVD's ARE NO LONGER BEING SOLD! But you can still receive the metal detecting video as downloads to watch on your computer. The entire 13 episodes, was priced for just $9.95. BUT NOW you can now receive my TV series, to watch on your computer, all 13 episodes, PLUS, 5 of my ebooks, at the same price of just $9.95. That's right! Purchase my ebooks, and my TV series links for just $9.95. 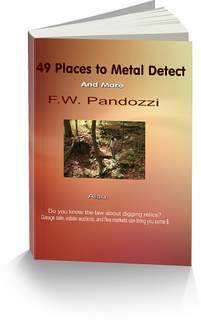 REMEMBER, this metal detecting video series is a PDF of the TV links, all 13 episodes. You will not be able to purchase this series, or my eBooks anywhere else. IMPORTANT VIEWING INFO. Depending on your computer operating system, it may take a few minutes to view the trailer. If you have any problems, you can contact me through the “Contact Me” form on our home page. Thank You, and I hope you enjoy the series! “Dear Frank, I love the outdoors and I love history. Your metal detecting series added an excitement to both of those loves. It was GREAT! And now, I may end up buying a metal detector. For more customer testimonials please visit here. My metal detecting video became the idea for this website.